The Thomas Tuchel Express – All aboard, but where will it stop? Thomas Tuchel may have been a dugout absentee since May 2017 but this hasn’t quelled the intensity surrounding his future. With constant links to Bayern München it was widely thought that the ex-Dortmund head coach would be a summer addition to the Rekordmeister – however, reports from Germany overnight now throw that assumption to the wind. For a coach once lauded by Pep Guardiola as his natural replacement at Bayern, just where does the future lie for the talented 44-year-old? Only two weeks ago it was considered a certainty that Tuchel would replace Jupp Heynckes at Bayern München – the 72-year-old himself commented that Tuchel has the right blend of qualities to succeed him as head coach in the summer. That comment was enough to send the speculation into overdrive, so much so that Heynckes quickly followed his ambiguous quip up with a “I’m not ready to step down just yet though”. Tuchel had turned down Bayern, preferring to try his hand on foreign shores, and so the biggest story of 2018 was about to grow legs. With Sven Mislintat head of recruitment at Arsenal the prospect of Tuchel teaming up with him is an obscure one. In the final months of Tuchel’s reign as head coach at Borussia Dortmund him and Mislintat didn’t speak for months. The relationship hit the rocks after the failure to sign Óliver Torres from Atletico Madrid, finally culminating with Tuchel banning Mislintat from Dortmund’s training ground. 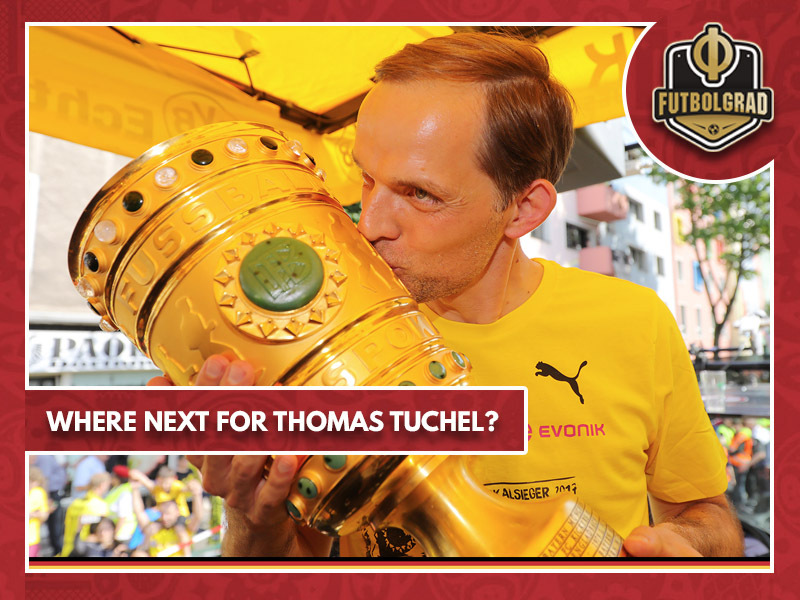 Thomas Tuchel flew to London on 2 Mar and the Futbolgrad Network now understands that he met representatives from Chelsea with a view to succeeding Antino Conte in the summer. Quite how the talks progressed are unknown, what is known is that Tuchel is keen to work at a club who have Champions League status – a scenario that could be out of the West London clubs control, Chelsea are five points behind fourth placed Tottenham Hostspur as the Premier League’s fight for European places reaches it climax. The Qatar backed club certainly have the financial clout to attract Tuchel to France and their Champions League status for next season is already assured, it would be an interesting proposition for Tuchel. PSG have made no secret in their desire to win the UEFA Champions League, domestically they are in a different galaxy – similar to Bayern München’s current position in the Bundesliga. The Parisians have a multitude of world stars and with that comes ego. A criticism of Tuchel in the past has focused on his empathetic nature to deal with large personality footballers, very much confident in his own ability he does not suffer fools – it is very much his way or the highway. An outside chance but one that would appeal to Tuchel himself. He is a student of the game and respects the work of Guardiola and what he achieved at his time at the Camp Nou. This respect works both ways and should the Catalan giants be tempted to move Ernesto Valverde on in the summer – Tuchel already comes with a recommendation from the Barca legend.